May my mind always float in the ocean of divine nectar emanating from the lotus feet of Srimati Radharani. No more fear of millions of hells. Studying of the scriptures has become simply troublesome. Merging into the brahman effulgence is terrible. The ecstatic symptoms of devotion to the Lord that are felt by the great devotees like Suka have lost their charms. O Radha! You are my sole Ruler and only shelter. Countless gopis of Vraja swarm around Your lotus feet and worship them wholeheartedly. Your lotus feet are an inexhaustible fountainhead of the quintessence of universal love and are inconceivable to great saints. That is perhaps the reason why great devotees are striving with ever increasing courage and hope to catch the sweetness and beauty of the grace that flows from Your lotus feet. O Queen! Will You be pleased to show me the particular manner in which I should serve Your lotus feet? Lotus chanting of the holy name of Lord Hari with love attracts my mind towards Sri Radha's feet. This attraction becomes very strong as soon as the delicious ingredient of Sri Radha's service is added to the chanting. Meditation on blissful Krsna as He roams about in Vrndavana has put me under the shade of the tender feet of kind Sri Radha. 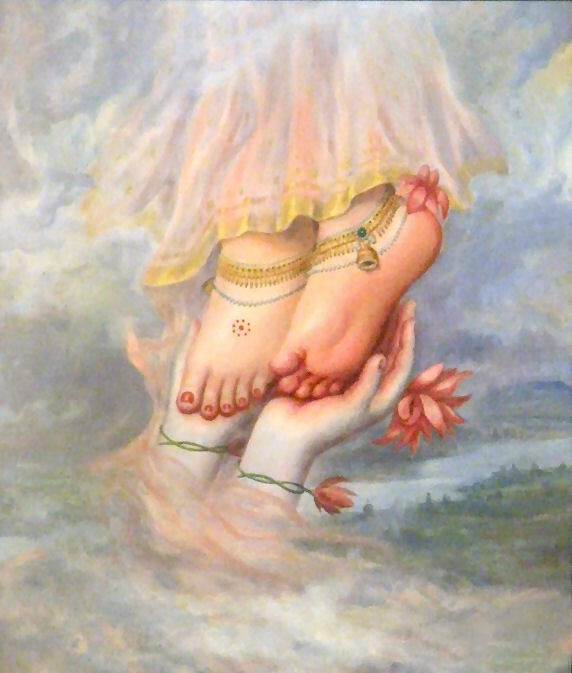 My only shelter is Sri Radhika's lotus feet which I yearn to worship with love and devotion. These lotus feet of Srimati Radhika are painted by Krsna's soft fingers with a feather dipped in the most fragrant red-colored juice. The gopis follow Krsna's example and worship the same feet for the happiness of all living entities. These feet are glorified in the Upanisads, and are found in the depth of the hearts of pure devotees. O Vrndavanesvari! O Sri Radhe! I pray for the shelter of Your lotus feet. Your lotus feet are treasure house of nectar of divine love. Syamasundara keeps them safely and dearly in His heart. These feet are the supreme cooling remedy for the blazing fires of this material world. O dear Sri Radha! When out of sheer compassion, and moved by Krsna's overwhelming love for You, will grant Him His prayers to message Your lotus feet? At that time, I shell look at the ecstatic smiling faces of both of You, and so encouraged I shall hug Your feet with my hands, and taste the nectar of Your lotus feet to my full satisfaction. O Vrsabhanu-nandini! I bow down to Your lotus feet with great awe and reverence, from which selfless love is ever pouring forth in abundance. In His ceaseless and tireless efforts to win Your grace, Sri Krsna, the God of love of Vrndavana and Supreme Almighty, always solicits the favors of Your servants with love and affection. I know, and it has been confirmed by all reliable authorities that Madana-Mohana Krsna would be so ecstatically delighted to see pure devotion unto Sri Radha's lotus feet that he would descend from His worshipped throne to embrace, kiss, give His chewed betel nuts, and garland to Sri Radhika's devotee. When shall I be blessed with such devotion, getting such treatment from Krsna as my reward for devotion to Radha's lotus feet? O Radhika! When shall I enjoy the fortune of having my head used by You as Your footstool? Your feet, which are the life-treasure of Govinda, will then be a crown on my head. They will further bathe my head with a pure nectarine flood of love that always flows among Your devotees.